I am a mother of 3. I am wearing my third child here when she’s around 18 months old. With my other children not allowed to come to baby swimming, I had to go it alone while hubby kept the big ones at home. We go to baby swimming every week in the municipal pool in Antibes (France) where the Olympic hopefuls train and there is a view of the Mediterranean Sea. We’re in the pool shower after one of the sessions. I’m wearing a Babyette water sling. This has been a fantastic purchase for summers at the pool and the sea, and especially for the pool shower. This was in October 2011, when my baby was 18 months old. 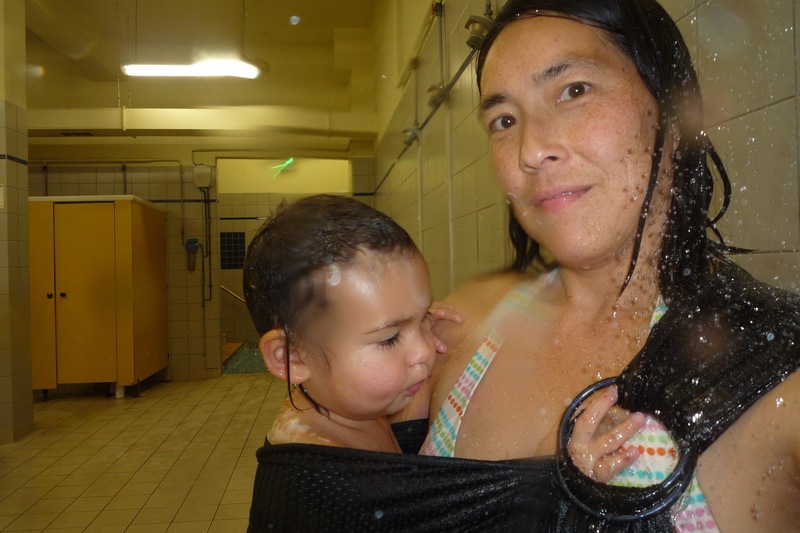 But we used the water sling from the time we started baby swimming with her (she was 5 months old). I’ve taken all 3 of my children to baby swimming for the first 4 years of their lives and they loved it. But I learned with my first 2 that holding a slippery,wet baby and trying to wash her under the shower is dangerous and stressful. Even when my 2nd child could walk, she would often fall on the slippery floor if I set her down. So when I was pregnant with my 3rd, I bought this water sling for this purpose and I was very happy with it.